Cleanse the interstitial tissues of every part of our body, removing waste and damaged cells. Plays an important role in keeping infection from spreading. 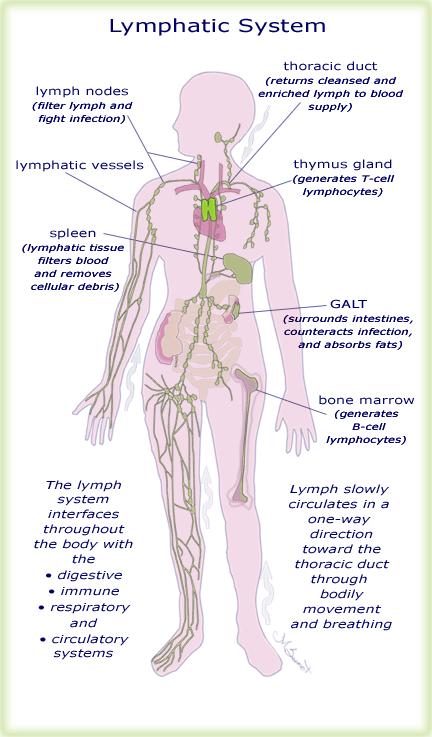 Lymphatic drainage is a very different kind of therapy that specifically works to drain lymphatic vessels and nodes, and to stimulate the associated lymphatic organs to help drain and cleanse this fluid from the body. Especially useful before and after surgery, it also helps to reduce edema. It can be helpful in dealing with some kinds of chronic pain and it stimulates the parasympathetic system, thereby reducing stress. As a general health maintenance, EHM recommends clearing the lymphatic system at least 4 times a year with several sessions, usually at the change of seasons. This is a very light , relaxing treatment. We encourage light eating and drinking plenty of water prior to and after your appointment. Use it as a starting point for any detoxifying regimen.